When it's raining cats and dogs, yummy Vietnamese streetfood will surely put a smile on your face. Saigon has entered the monsoon season, and these are eight things you can do, from the rich offal stew to slightly burned sweet potatoes on charcoal, to make the rainy days just tastier. 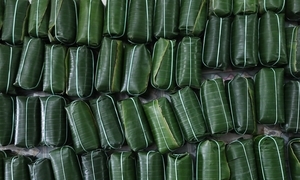 Pha lau, an exotic streetfood commonly found in Saigon, is an offal stew filled with pig or cow innards and cooked with herbs and seasoning in a way similar to curry, although not as spicy. What makes this dish unique is the chewy pieces which are yet soft enough to melt in your mouth. If you are wondering, “Would the taste or smell of the organs is too strong for me?” Then do not worry since the long cooking process had eliminated any unpleasant taste and odor. Each vendor will have its unique way of flavoring the broth. You can also order some bread to eat along with this rich broth. Locals also dip the organs into fish sauce with minced chilies to enhance the flavor. Fresh stripped crab meat is the star of this delicious dish. 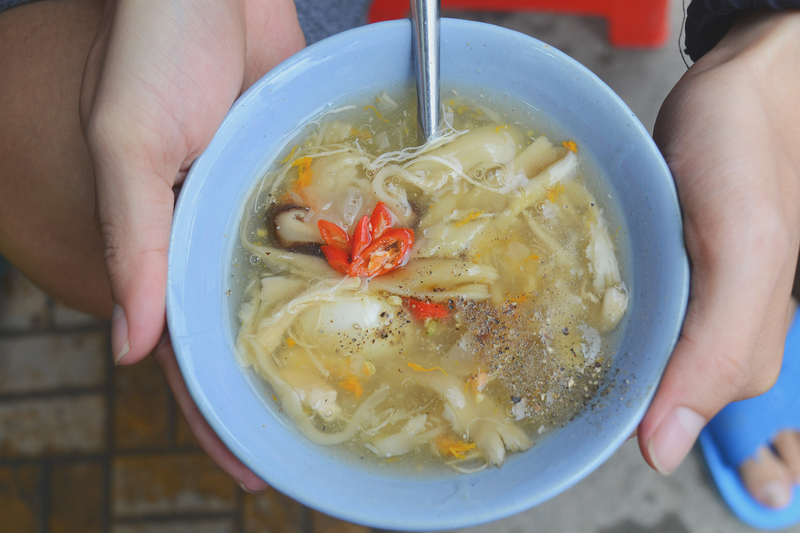 Crab soup is a perfect comfort food that many Vietnamese are familiar with. The soup has crab, tapioca starch, shitake mushrooms, snow mushrooms and quail eggs. 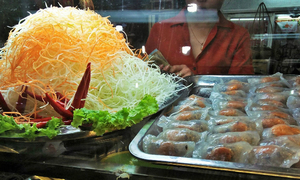 One must-try location would be the stall on the Nguyen Du Street corner near the Notre-Dame Cathedral. But you can also easily find this soup at big wet markets such as Thiec, Ho Thi Ky and Pham The Hien. It is hard to deny the delicious smell of corn and sweet potatoes burning on charcoal on street carts. Corn ears and sweet potatoes are cleaned before being grilled to perfection. You can never go wrong with neither option since it is not only cheap, with roughly VND10,000 (44 cents) for each potato or corn ear, but the sweet taste will also surely calm your soul. Banh duc, also known as the Vietnamese rice dish for the penniless, is a thick and savory rice porridge that has everything. Ms. Hong, a vendor in Phu Nhuan District, has been serving the dish for the past 40 years, and hers is praised by many as among the best in town. 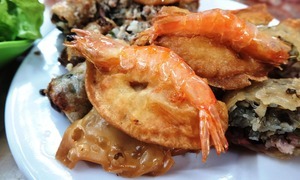 Or you can head to “Ba Gia” (The Old Lady) shop in District 10 to try this awesome dish. The place opened around three years now, but has slowly become a frequent stop-by for the locals during rainy season. Besides the main ingredients including ground pork, fried onions and scallions, “Ba Gia” also adds beef sausage as its own twist to this dish. In a small alley on Tran Ke Xuong Street in Phu Nhuan District lies “Huyen” restaurant, where the owner has been selling her unique dish to Saigon locals for the past 40 years. The owner said this is a family recipe that she learned from her mother. The dish has two main parts: a bowl of dry instant noodle mixed with chilli flakes and another bowl of hot broth with chopped beef, egg, and minced shrimp. A portion costs VND40,000 ($1.76). Saigon serves different kinds of porridge, with everything from pork intestines to frog and fish. Intestine porridge, or chao long, is cooked in a brown broth made from braising a pig's bones, head and innards. It is served with pieces of tongue, heart, liver, chitterlings and cooked blood pudding. The highlight is the doi, which looks like a Western sausage, but is filled with a mixture of cooked blood pudding, mung beans and herbs. Some shops also serve fried doi and chitterlings. If you are a fan, visit “Co Ba Da Kao” restaurant in District 1, where a bowl costs VND40,000 ($1.76). 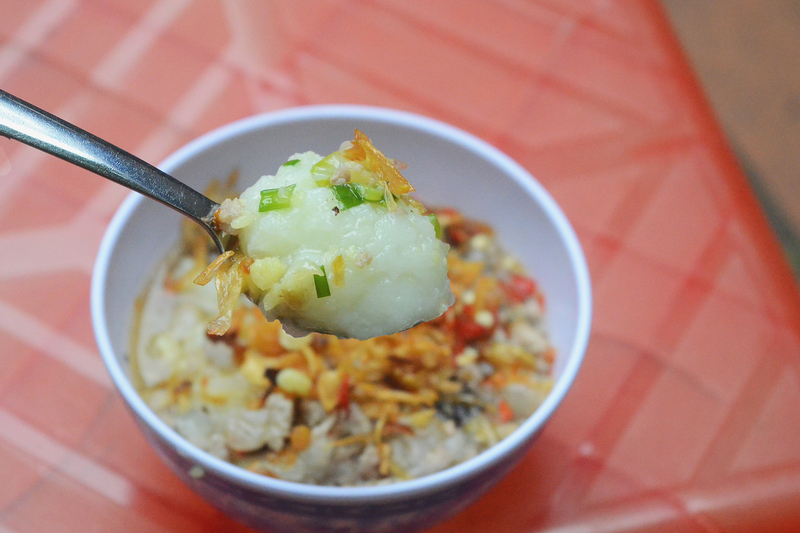 For other types of porridge, you can explore “Tieu Porridge” restaurant at Ban Co Market in District 3, or diners at Tan Dinh Market in Distict 1. Bun moc is a rice vermicelli soup served with chicken or pork broth, and comprises Vietnamese ham and sausages of all shapes and types. 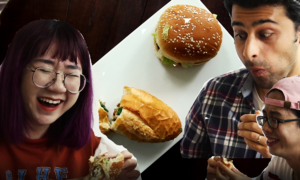 Thanh Mai restaurant on the corner of Nguyen An Ninh and Truong Dinh Streets in District 1 is one place to experience the most authentic bun moc as it has been serving since the 1980s. The restaurant opens at 5 a.m. every day, so you can come for a healthy and flavorful breakfast for VN60,000 ($2.64). Hu tiu is a kind of rice-based chewy transculent noodles which is more of a southern Vietnamese dish. Hu tiu in Saigon is served with different ingredients: pork ribs, pork offal, shrimp, squid, wonton dumplings, fried garlic, fried shallots and scallions. One popular place for hu tiu is Thanh Xuan sidewalk restaurant on Ton That Tiep Street in District 1. With VND30,000 ($1.32), you can have a full bowl.